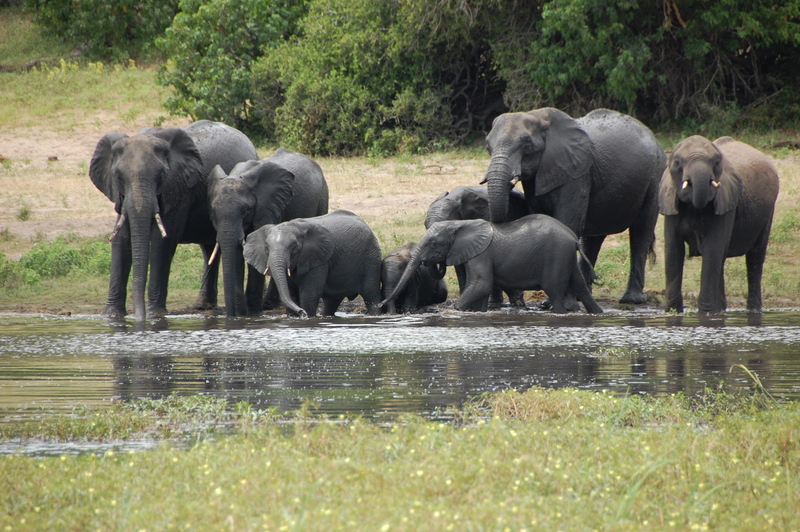 It’s very fascinating to watch a herd of elephants come out of the bush to a pool for a drink at the end of day. You’d think that it would take a lot of gurgling and slurping to fill those huge bodies with fluid. Adult males weighing in at two tons apiece, needing 300 gallons of water to feel good– all crashing down to the waters? But not at all. Elephants must be the quietest drinkers in the world. They just drop that long trunk down into the water like a straw into lemonade. And they drink. That’s what makes it almost magical, to watch them from a distance while the breezes of Zimbabwe’s Hwange Game Park whisper around you; a herd of elephants at the close of day, having their own quiet happy hour without a sound. 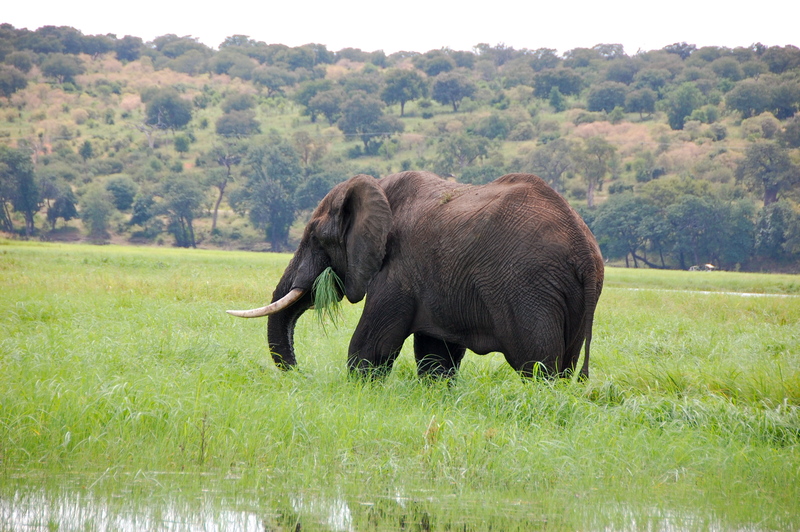 We were also surprised at the sheer number of elephants that kept streaming out of the bush that evening, making their way down to the pond. There were maybe twenty-five to start, trunks down quickly in the setting sun. Then two herds dropped down from the hills behind them, stately and majestic in their file until the matriarch got to within five feet of the pond. Then the orderly queue gave way to a miniature stampede, to get into that lovely water, to stand knee deep in its coolness. Another large herd appeared off to our left and behind them, a huge bull appeared out of the trees to have a look. Not for him, this common cup. He was waiting until he could drink alone. By now, there were well over fifty elephants, all knee deep, sucking up water. Another herd arrived in a swirl of dust and, just as they began to nudge their way in, an earlier group packed up and left. As though to say, “No, if they’re going to allow this crowd in, we’re outa here!” At the peak, there must have been a hundred elephants, all drawing upon the resources of one large pond, in the Hwange Game Park. It made you wonder if this pond would be sucked dry! This was like council water in our town being taxed to the limit around bedtime, when the demand on the water supply would be at the maximum. And yet, the water level at Hwange was absolutely constant. The hippos continued to wallow contentedly, snorting and billowing from the depth of water that they lived their submerged lives in. Life went on. How marvelous that the resources of the Lord are infinite! Because we come to him with big needs, needs that loom on the horizon like an elephant. I still remember driving into Hwange for the first time, warthogs scampering along the side of the road. “Oh my goodness!,” someone gasped. And there it stood. Against the pink glow of an evening sky, a huge black elephant in majestic silhouette. It was like a Zimbabwean mass of granite. Some needs are like a great thirst, so great you wonder if they can ever be fully met. Call it an elephantine thirst. Indeed we might lumber along, like an elephant in a drought, never having a great thirst “quenched.” And “quenched” is such a lovely word. A great thirst is satisfied. Ahh. We have drunk deeply at the waters of life. This is the language of Pentecost. And what lovely fullness has been received!